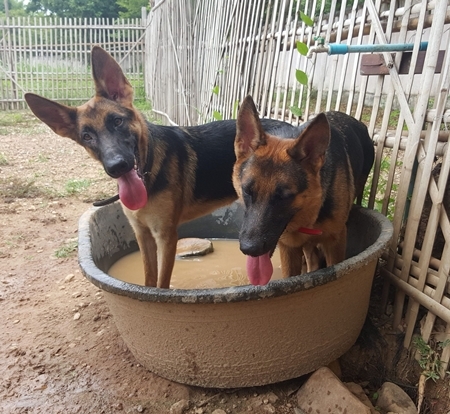 These two young German Shepherds are outgoing, friendly and loyal. Serena and Blair are two young sisters that are the essence of happiness, and are so pure of heart - you feel it as soon as you meet them. German Shepherds are an amazing breed. They are extremely intelligent, strong and sensitive. The shepherd is incredibly loyal and obedient, showing a great willingness and eagerness to learn. They will need training and socialization and so therefore we are looking for someone with experience with large dogs, or this particular breed, to adopt Serena and Blair. A person that is familiar with shepherds and understands the issues in their training, health and wellbeing are of the utmost importance. These two darlings love people, and thoroughly enjoy their daily walks, something they will need to maintain their fitness, helping to ensure long their healthy lives. Can you meet Serena and Blair’s needs and provide them with a wonderful, cultivated life experience? German Shepherd Dynamic Duo - Serena & Blair!